In case you didn’t already know how important pH is to your body…. The human body’s natural pH is approximately 7.4 and similar to our body temperature, the slightest increase or decrease can cause noticeable effects. Red wine tends to fall between 3.3 to 3.6. Although it provides great benefits to your blood and heart, it’s just as acidic as soda. This acidity is due to sulfite, the second most important ingredient in winemaking. Sulfite provides a perfect environment for fermentation, killing any harsh bacteria, fungi and mold that grow in the barrel. But this fertile environment doesn’t change after being bottled or opened. The reaction that takes place in your digestive system affects 8% of all Americans. This causes immediate and noticeable changes such as headaches, itchy skin and sweaty face or hands. In some cases, sulfite can result in more serious conditions such as IBS and joint pain. …that does not remove the sulfite. to a safe and healthy mineral commonly known as Sulphur. This process requires three ingredients harvested in Norway’s North Sea and are 100% organic. Like so many other preservatives; natural or otherwise, sulfite guards against some bacteria and allows others to flourish. We have found that Chitosan, also harvested from shellfish in the North Sea, solves this problem. This is one of the most widely used natural products in water purification systems and effectively attracts impurities. 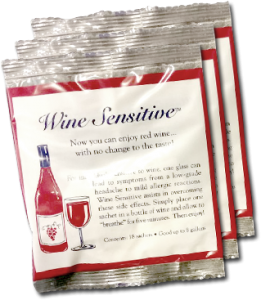 While the Ph levels rise in minutes, stomach irritants are attracted and neutralized by Wine SensitiveTM. You’re probably familiar with the Alkaline Diet, consisting of foods that promote a balanced and healthy Ph. Use of Wine Sensitive doesn’t quite reach that perfect mark of 7. But we do eliminate the headaches, sweats and irritability while providing rich vitamins and minerals.